If you've seen the previews, you know that Greenberg features Ben Stiller in midlife crisis mode, wandering around L.A. looking lost and offering sardonic observations (at a coke party, he informs the kids that they were too pampered, growing up listening to "Baby Mozart"). If you've seen Noah Baumbach's recent films - the excellent divorce memoir, er, fictional piece The Squid and the Whale or the repulsive Margot at the Wedding - you'll know that the film's bound to have more up its sleeve than the genial trailer indicates. Indeed, Stiller's character - Roger Greenberg - is more asocial and pained (and oddly enough, more grounded) than the ads suggest. What's more, he is introduced gradually, tangentially, with the movie initially focusing on Florence Marr (Greta Gerwig), as she runs errands and does household chores for the rich Hollywood family she works for. She'll be looking after their house and dog while the yupster clan cavorts in Vietnam; meanwhile Roger, the brother of Gerwig's employer, will be staying in the home and supposedly building a doghouse - ostensibly for the pet, but it might as well be for himself. Roger's life has been off-track for fifteen years, ever since he destroyed his popular rock group's chances at a record deal. His buddies never let him forget it, but their spite is also tempered by pity, particularly in the case of former best friend/recovering alcoholic Ivan (the most likable character in the movie, played with sorry grace by Rhys Ifans). While they've all grown up (to the extent one can "grow up" in L.A. where, as Roger observes, all the kids dress like superheroes and the adults dress like kids), raising families and making money, Roger remains mired in the past, in stasis. He's just emerged from an indeterminate stint in a hospital ("not that kind of hospital" Roger's brother wryly corrects Florence, when she asks what he's got). A Gothamite ever since college, he's out of place in the City of Angels where - to drive the point home (no pun intended) - he can't even operate a car. We gather these details bit by bit; after following Florence for the first fifteen minutes, our point-of-view transfers to Roger when the two have an awkward run-in at the house, and for the rest of the film we'll oscillate between the characters, picking up inklings about Roger's personality and past along the way. Actually, these anecdotes and quirks merely fill in the details. From our first glimpse we know that he's odd, somewhat charming, pathetic, and - in some hard-to-pin-down way - sad. This being a Baumbach production, there must be at least one aggressively offputting sequence. This time there's no pre-pubescent masturbation or fascination with the yuckier aspects of the body (no vomiting or merciless long shots of Laura Linney peeling skin). Instead we get a thoroughly unromantic hook-up in Florence's bachelorette flat in which Roger shares a few sips of Corona and goes down on the young woman, his brother's employee with whom he's exchanged a few cursory words, post-haste. He seems vaguely scummy - all the more so when he puts Florence down, coldly tells her not to invest herself in him, and then comes running back again, as he's wont to do for the duration of the storyline. Sound unappealing? Perhaps, yet the movie is quite engaging: it has a relaxed, naturalistic texture in which life unfolds in a pace and style somewhat akin to reality. Roger's dilemma, which in the trailer seemed like a self-indulgent device out of touch with the economic times, here registers with a note of individual truth. He doesn't for a moment fit in with a younger generation, but he hasn't moved along with his own - and he's stranded. One of Roger's OCD traits is to write indignant, carefully worded complaint letters to a number of offending parties (American Airlines, Michael Bloomberg, the "pet taxi" fleet). He also leaves a long voicemail for Florence after a drunken, drug-fueled party - a message he describes as "more of a letter" than a phone call. The film itself is a kind of letter, a love note from Baumbach to the younger generation. It may be written in invisible ink - the kind that fades after it's penned; the filmmaker's ambivalence manifests itself through the interplay between the intrigue and dismay with which Generation X faces the Millennials. At its best, the younger crowd (once known as Gen Y, before they emerged from X's shadow) is represented in Florence - flaky yet responsible, eccentric yet self-aware, melancholy without self-pity. At its worst, see those little shits at the aforementioned house party, led by James Franco's giggling little brother, whom Roger castigates with that Baby Mozart put-down and numerous confused, out-of-touch references to My Space and Facebook. Even here, obnoxious as the arrogant twits are, they don't seem to fit into the generalizations Roger imposes upon them ("I read an article about you guys once..."). Above all, the film is touched and challenged by "mumblecore", a movement of primarily video-based young filmmakers employing handheld camerawork, improvisations, and collaborative filmmaking to examine relationships in the viral era. (They don't like the term "mumblecore", but they're stuck with it, like the beatniks and Indians before them.) While navel-gazing and at times amateurish, the mumblers emanated a freshness that was needed in this age of increasingly expensive indies and ever-slicker blockbusters - besides, how many other directors under thirty come to mind? How about under-thirty-five, industry stalwart Jason Reitman aside? Anyway, Gerwig, after starring in Baumbach protege Joe Swanberg's Hannah Takes the Stairs, became the poster girl for the group, and her presence here is an indication of the director's regard for the kids. The film also features Mark Duplass, one half of the mumbler's quirky answer to the Farelly Brothers (the new Duplass movie, a relatively mainstream if odd-looking comedy starring John C. Reilly and Jonah Hill, was advertised before the feature). Baumbach's style remains his own, though the sun-dappled close-ups and casual aesthetic seem reminiscent of no-budget mini-dramas. Occasionally he cribs a page from the mumblers for satirical effect: as when he has Gerwig share a rambling, seemingly improvised weird anecdote about a sexual tryst and a baffled, disgusted Stiller storms out of the room, grumbling, "What the hell was the point of that story?" The film concludes on an ambivalent, half-finished note that recalls the work of Andrew Bujalski (by far the most talented filmmaker of the young generation). 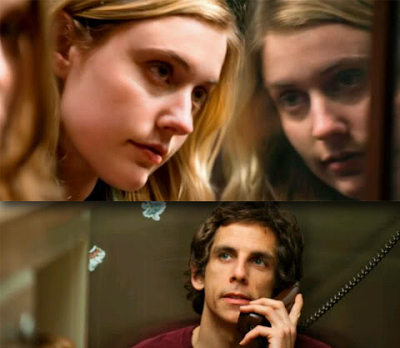 It's not out of character for Baumbach either, of course - both Squid and the Whale (which, preceding mumblecore, seemed informed by another contemporary filmmaker, Wes Anderson) and Margot at the Wedding finish with uncertain anticipation rather than full-on resolution. Yet (spoilers ahead - if you can call them that) this can be counted as a happy ending, lacking Margot's bitter aftertaste (we can't imagine mother and son are suddenly going to be happy after all the misery we've witnessed) or Squid's melancholy grandeur (the museum display offers a metaphor, but certainly no solutions). In Florence's cozy apartment, sunlight filtering through the blinds, the lovers finally seem to have mellowed out. Florence is still recovering from an abortion and the effects of anesthesia linger across her tired expression, while Roger has just nixed an adventurous jaunt to Australia in the company of his chatty, adolescent step-niece, and is still coming down from the adrenaline surge accompanying another escape. They both seem perfectly content, for the moment anyway, to be where they are. "Life is wasted on the living," Roger remarks bitterly in an early, amusing scene but while the film doesn't exactly fall for the glib notion that "life gets better after forty" it finally observes that maybe it can, if we want it to. I'm not one for Baumbach...I hate to use this philosphy, but if I wanted to see real people be quietly horrible to each other, I would stay home. Sometimes, I have limits to how much human misery I'll tolerate in a comedy. I dislike Baumbach's films because,although he thinks he's bravely telling the "truth," he's actually both smug and whiny. He's seen people be MEAN to each other? They've even been mean to HIM? He's SUFFERED? Well, whoop de do, Baumbach, that's only happened to every one of the five billion people on earth. And you're a lot better fed than most of them. Get a grip and show us something new. Margaret, I saw Baumbach speak once, after a screening of Margot at the Wedding, and he was quite unpleasant, condescending and arrogant, so I can relate to what your saying here. However, I feel that his better movies tend to be somewhat critical of the characters onscreen - sympathizing to a certain extent with their narcissism but also standing outside of it and regarding it with some skepticism. I didn't care for Margot and this one was interesting but ultimately not much of a standout. Kicking and Screaming however was good fun (have you seen/what did you think of that one? it's much less bitter than his more recent work). And I thought Squid & the Whale was excellent. MovieMan, you're probably more fair to Baumbach than I am--certainly more balanced. It's just that I'm still recovering from Margot at the Wedding, and that sensation of being drenched in battery acid. I haven't seen Kicking and Screaming, but certainly will. The Squid and the Whale had a brutal charm, but was so ZAP and POW! emotionally that viewers were staggering out of the theater. . And where does he find these parents, anyway? Probably in his past! I agree on Margot - I've nothing against aggressive or poisonous films, but could they have a little aesthetic enjoyment at least to leaven the bitterness? The movie looked like a hangover.